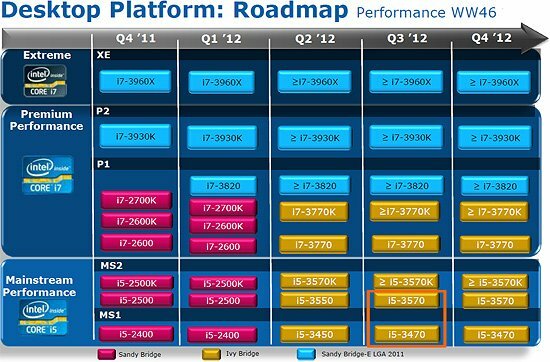 X-bit Labs reports Intel's 22nm Ivy Bridge processors have been delayed to Q2 2012, with April being the most likely launch month. Intel Corp. has notified its partners about its decision to introduce of its next-generation code-named Ivy Bridge processors in the second quarter of 2012. Previously the company planned to release the Core i 3000-series central processing units (CPUs) for desktops in March - April timeframe, which left a possibility to unveil the chips in the first quarter. The reasons why Intel decided to postpone the launch of the world's first desktop microprocessors made using 22nm transistors presumably to April from March are unclear. Perhaps, the company wants to ensure that there is no internal competition between existing Core i "Sandy Bridge" 2000 and future Core i "Ivy Bridge" 3000 chips. Maybe, the ramp up of brand new CPUs is taking longer than expected and Intel needs additional time to deliver enough products to the market.